My tyre fitting machine is my best friend! I do not like rushing this part of the work. If it takes a minute or two longer to fit a tyre, well that’s what it takes. The important thing is to not scratch the rim. Taping off the rim and giving extra lubrication can mean the difference between a great finished off job or a job that looks used. 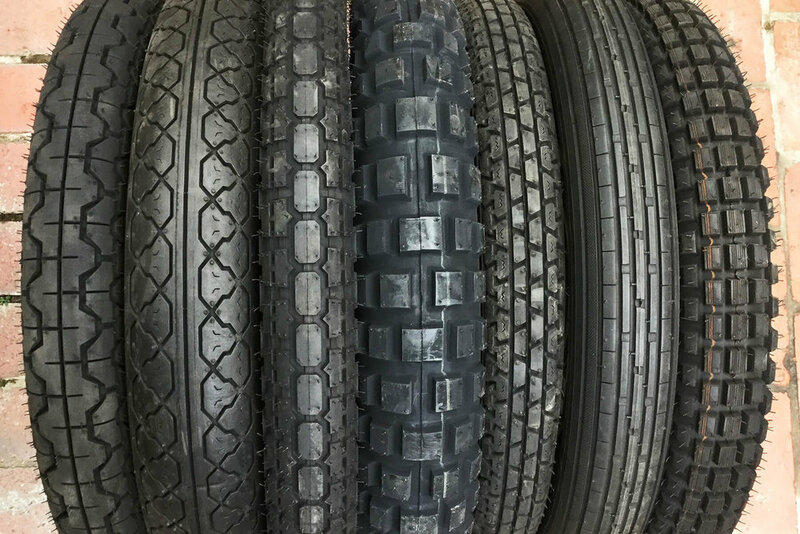 I keep a good range of inner tubes and rim tapes and can purchase tyres in as required. I stock Kenda tube because they are available in all classic sizes and also have good reinforcement around the valve stem. They do not go flat when your bike is sitting around over a couple of months like some other brands. They may lose or gain a psi or two with ambient temperature. I run these in my own bikes and they do not let me down. Also it pays to check your tyre pressure regularly and keep a pressure gauge and pump in your workshop for quick and easy access. SICE, Italian made tyre changing machine. Vee Rubber Fatass and 23inch.